Richard was therefore the third in line for the throne when he was born. But his older brother died when Richard was 4, and their father the Black Prince died when Richard was nine. That left Richard as the heir to the throne after his grandfather, Edward III. So when Edward III died a year later in 1377, Richard became King Richard II at the age of ten. Historians have varying views about Richard as a king, but Shakespeare's plays presents us with a king who in many ways still acts like the ten-year old boy who was crowned in 1377, even though the events of the play take place more than twenty years later. Richard is impetuous, irresponsible, playful and imaginative with language, overly dramatic in everything he does. He seems to identify completely with his role as king and believe wholeheartedly in the divine sanction that comes with his crown. As a result, he is completely unconcerned about the consequences of his actions early in the play — and completely lost when his kingship is later taken away and he has no idea who he is without it. The historical Richard was a great patron of arts and literature — Geoffrey Chaucer was in his service for a time — and Shakespeare's Richard speaks as eloquently and poetically as any of Shakespeare's characters. Richard's "Death of Kings" speech is one of the great monologues in all of Shakespeare; it's also the pivotal turning point in Richard's development as a character. In this speech, he is forced to consider for the first time who he would be if he was not the king. He continues to wrestle with this question for the rest of the play, from the iconic mirror scene to his final scene in the play. As is so often the case in Shakespeare, Richard must lose everything in order to come to a better understanding of himself. As he struggles to come to terms with his own mortality and the harsh realities of life for an ordinary human being — as opposed to a king, God's deputy on earth — he begins to understand his own responsibility for his downfall and his dependence on the good will of others. He is able to express gratitude and compassion in ways that he never could earlier in the play. It's not a complete transformation, but by the end of the play, Richard is clearly a different person than he was at the beginning. But is it too late...? What is exciting about playing a character like Richard II? For me with Shakespeare, it's always the richness of the language, so Richard is especially fun because he so enjoys to hear himself speak, he speaks well, often filled with metaphors and images, and seems to even rhyme unconsciously. What is challenging about playing a character like Richard? Putting all the pieces together -- managing conflicting interpretations in yourself and from others, and hoping you don't have so many ingredients involved that you ruin the recipe. 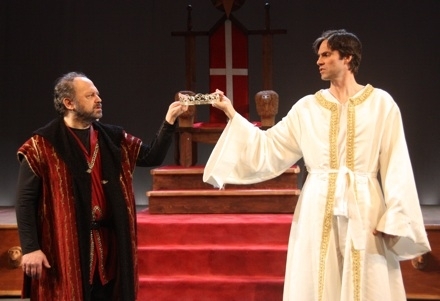 Have you seen other actors perform Richard II? Is that something you think about? If so, what did you think of them? Sure, I try to absorb as much info about a role as I can, (with Shakespeare, there's always too much, though I like the variety). The video productions I watched were mostly boring, but they all helped me understand the characters, the story, and the breadth of interpretation. Some were interesting pieces of art in their own right, but only after I understood the play better. How do you approach preparing to play a large role like this? I start with research — reading the play, watching videos, reading some commentaries. Some of it's rubbish, but there's usually something interesting to glean from everybody who's thought seriously about the play. While I take bits that make sense to me, I also generally let my research feed my intuition, meanwhile melding it with what I learn from the director, from the other actors, and from the audience we're performing for. Then I drill the lines measuring out the iambic pentameter and often taking clues from the First Folio. Also, I usually benefit from some sort of athletic training mixed with occasional meditation — for stamina and peace of mind. You've been acting for a long time — can you tell us a little about your background and training? I started acting at age nine with cheesy church musicals in the bay area of California followed by community youth theater off and on through high school. At UC-Berkeley and Wake Forest University, I started to take classes amid occasional productions, graduating with a theater minor from Cal. I got an MFA in Acting from ACT in San Francisco a few years ago which provided for some good classical training. Acting is fun work when you get it. Actors are often taught to be an advocate for their character, but Richard does some pretty unpleasant things. How do you approach playing a character that behaves this way? He does? :) Interesting question...I suppose I take being an advocate for my character for granted. Don't we all feel justified, at least at the time, for our actions? It occasionally requires reverting to childish tendencies that we've all had at some point — but unlike Richard, we fortunately didn't have the power of a real kingship behind us at the time. What is the most important thing you would like audiences to understand about Richard? Richard was basically made a king against his will, and there are signs to me that there are aspects of kingship he was pretty weary of — and that he may have been a pacificist. We all have an instinct for freedom, but even with all his wealth and power, freedom was perhaps no less elusive for him. 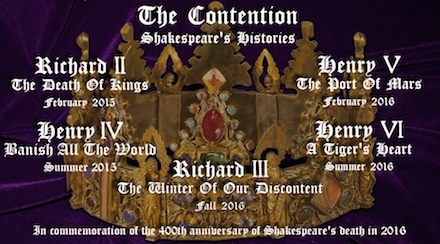 Tickets for Richard II on sale now! Tickets can also be purchased by calling the Hangar Box Office at 607-273-2787.